Watch as Dallas Teague, "Detective Dallas," interviews Marc for ABC 3340. 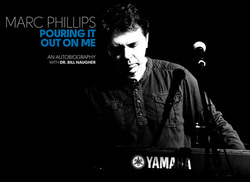 An excerpt from the new autobiography Pouring It Out On Me from Marc Phillips and Dr. Bill Naugher. "It was a cold, dark night in November 2005. While the day was probably insignificant to most people, it was the lowest point in my life. I was a fifty-year old man lying shirtless on my back, on the bathroom floor, crying like a child. I had just thrown up again and was as sick as I had ever been. The cancer treatments were even worse than I could have imagined. My seventy-four year old mother, who had moved in to take care of me, cleaned up the bathroom and got down on both knees next to me. Thank God for the never-ending love a mom has for her children. While comfort can come from various people, no comfort is any greater than that which comes from your mother. Weak and feeling totally helpless, I looked up at my mom and said, "If this is how it's going to be, I just don't think I can make it." She picked up my head, placed it on her lap, and gently rubbed my face. She looked down at me and said with complete confidence and composure, "Son, not only CAN you get through this, you WILL get through this." At that moment I realized that parents never cease to be an influence on their children's lives. To order Pouring It Out On Me directly from the publisher, click here or type http://crestpublishers.com/portfolio/pouring-it-out-on-me into your internet browser address window. The first time I saw Marc Phillips I wanted to be Marc Phillips. Just about every guy did in those days, which if I remember correctly, was around 1977, or so. Marc was Hotel’s front man and they were the hottest rock band around, complete with a bona fide hit record called You’ll Love Again that Marc wrote and sang. He had the hair, the voice, the girls, and a band that packed the house wherever they went, which was all around the country. They traveled with Toto, Hall & Oates, Little River Band. You know, it’s an inarguable fact of man life that every guy at some point in his life will stand in front of a mirror, play air guitar and try to hit the high notes. That point for most of us is every time we’re alone, too often when we’re not alone, and always when we want to embarrass our children. And try as we might to blow it all off as no big deal, deep down we all wish that for just once we could trade that air guitar for a real one and live the dream. Marc was living the dream. Fast forward about 45 years. Marc has written a book. It’s called Pouring It Out On Me. It’s the story of his life. A story that probably hasn’t gone the way any of us, especially Marc, would have predicted. Throughout the years, along with hit songs and screaming fans, came big disappointments, near misses, and flirtations with the big time that just didn’t pan out. And then there was cancer. And pain. And loss. And God. I’ve had the pleasure for many years to work with Marc. If you’re a client of ours and reading this, and if we’ve ever produced a piece of original music for you, and if that music has on it, a silky smooth, bluesy sounding voice that you think you might have heard on the radio, well, that’s him, Marc Phillips, my friend. No longer the long-haired rock star with his whole life in front of him, he’s just a guy whose whole life centers around his walk with God, and his love for his family. Read his story. It’s a great story. One that is far from finished. But one that reminds me that, in 1977, I wanted to be Marc Phillips. And, come to think of it, I still do. Cary founded blr | further in 1986. He never misses the chance to remind us that if you fix the brand through great performance, the advertising becomes the easy part.